LED lights have become extremely popular in the recent years. Grow lights consist of artificial light that is designed in a unique way to support plant photosynthesis. It’s normally used by farmers to grow a variety of crops because they offer a light spectrum just like the sun. LED lights usually provide much needed energy and heat to crops. However, if not taken care of, grow lights could get damaged and lose their value. 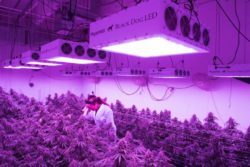 That’s why it is crucial to offer proper care and maintenance of your LED grow lights to ensure they continue offering proper service to your crops. If you’re wondering how to grow crops using grow lights, check out ledgrowlightshq.com to get a wide assortment of insightful information about this issue. Remember to keep the appropriate distance between your plants and the grow lights to ensure they thrive. A dirty glass will prevent light from penetrating and reaching your plants. Therefore, it would be a great idea to clean the glass regularly. It’s easy to forget about the dust and moisture that normally accumulates within the grow light. Ensure you clean the grow lights at least once every two months with an appropriate cleaner. This will guarantee that you get maximum light from the LED. Before you begin cleaning, unplug the light and use a soft cloth to remove dust and particles that might cause the glass to be scratched. Grow light fans usually collect a lot of fibers, dust and particles when operating to cool the lights. These little particles should be removed using an efficient air spray duster similar to that used for electronics. Avoid disassembling the grow light when dusting the internal fan. After all, assembling it back together might prove to be a complicated affair. If you can’t clean the fan by yourself, it’s best to contact a professional to do this for you. Therefore, ensure your fans are dusted as often as possible. Grow lights contain circuits that could short circuit when they come into contact with water. Therefore, it’s best to avoid water when operating them. In addition, it’s a terrible idea to place these lights in places that are filled with moisture. Power stabilizers help to reduce maintenance costs because they offer precise heat that enables your plants to grow. These stabilizers usually regulate voltage and wattage, thus reducing energy consumption and protecting your grow lights from damage that could result from power surges. Therefore, always ensure that your grow lights are kept far away from moisture. A clean grow light will work very efficiently to ensure your crops grow well. Therefore, cleaning the glass regularly will ensure you don’t have to worry about stunted crop growth. Dusting your fans will keep your grow lights cool and functioning properly. Keep the LED light away from moisture.